Most of the electronic interfacing to another system makes use of switch contact as a form of communication control. This form of connection interface is commonly known as Dry Contact. Dry contact is simple a switch contact that is activated through a relay. The use of such relay is typically only for signalling purpose. The signalling is very low in the current. 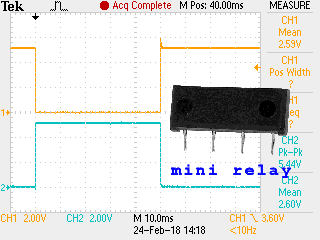 A very small mini relay is often good enough for the job. The switching contact of this relay can drive up to 500mA. LED indicator typically requires a maximum of 20mA. So this small relay is more than enough to switch on an indicator. Most logic signalling between circuit boards uses very low current. Typically around 1mA or below. 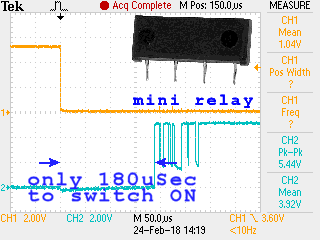 A small mini relay is more than good enough. The simple dry contact of a small relay makes it easy to interface with other circuit systems which uses different voltage as their power source. The following measure was done to test the switching speed for the small relay. Compare to an active switch like a transistor or solid state relay, the switching speed of a mechanical switch relay is still far from fast. Although it is not as fast as a semiconductor switch, the switching speed is considered fast enough for a very wide range of application. Mini relay only took about 180usec to switch ON. 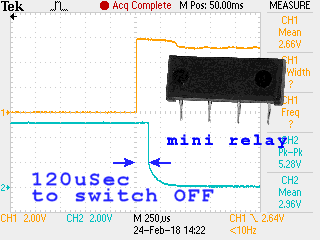 From the switching speed measurement taken, the delay switching of a mini relay is in the range of about 0.1 to 0.2 msec. For an application that requires switching speed in the range of 1msec and more, using a mini relay is very much acceptable. If you need an even smaller and faster switching device, you should consider a transistor or a solid state relay. Semiconductor is smaller in size, switch faster, and can cost lower than a mechanical switch. The lifespan is also longer. The disadvantage compares to a simple dry contact mechanical relay is that you will need to take more care in choosing and designing for a transistor switch. There is more specification that is under consideration. 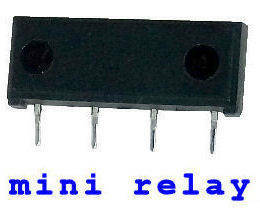 check out the mini relay page.